I enjoy finding beauty in the commonplace, and expressing that in my paintings. 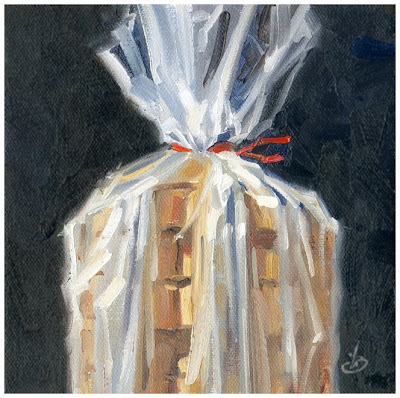 It can be something as simple as the transparency of a plastic bag on a loaf of fresh bread. Even the tiny red twist-tie adds something charming to the painting. Now all I need is some peanut butter and jelly. Mmmmmm! Have a delicious day filled with joy. And thanks for stopping to look. 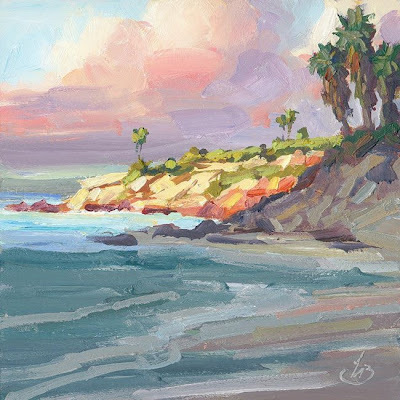 I painted this view of Newport Beach on Saturday morning while conducting a Plein Air Workshop for a number of other artists. It was a beautiful day at a perfect location. We all had a great time painting together, and I want to thank everyone who joined me there. With the right lighting anything can be beautiful. A pristine landscape or gritty urban scene. A cheesecake dessert or tasteful figure. Even a simple egg. 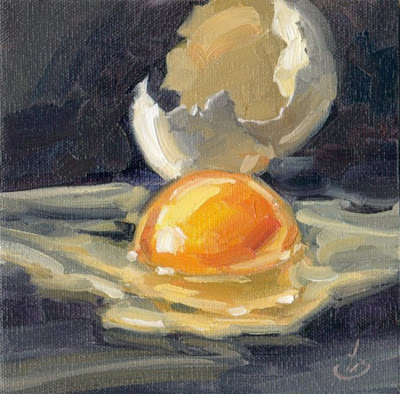 I was particularly interested in capturing the color in the white of this egg, especially the translucence and subtle hues. I was pleased with the results. I hope you like it. Have a delicious day filled with joy. Thanks for stopping to look. The reward for getting out before dawn was being able to capture this with only a few occasional cars passing. I dodged off the road as necessary, but was mostly left to paint in solitude. A foggy mist softened the sounds of the world, and added a crisp sweetness to the air. Morning traffic was flowing toward Los Angeles on the freeway in the distance, but the noises were muffled by the atmosphere. It was the start of a beautiful day. I was very pleased with this one. I hope you like it too, and I wish you a day filled with joy. Thanks for stopping to look. The day had started without much promise, but just before sunset the clouds parted and turned these cliffs to gold. It became pure magic! These are the moments Plein Air painters live for. I felt you might like to see a photo I shot earlier in the day. I was too busy painting to shoot photos at sunset! 1. 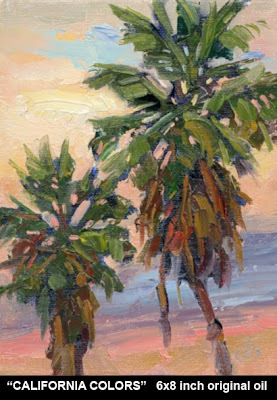 My Saturday morning Plein Air class this weekend will be at the ocean in Newport Beach. This session is open to all artists of all skill levels. Any medium is welcome, but I will be demonstrating in oils. Email me for details if you would like to join us: tombrownstudio@cox.net. 2. 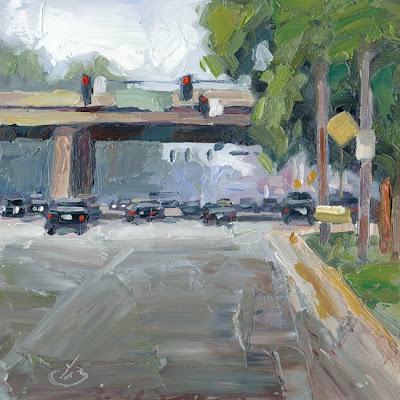 My new 5-week Plein Air Workshop begins July 12 and there is still time to enroll. If you can’t attend my workshops you may be interested in my CDs or DVDs on plein air painting. It’s the next best thing to painting on location with me. The DVDs are episodes from my TV show that were filmed live on location. Email for details: tombrownstudio@cox.net. Email me to purchase this painting. Are you looking for a larger painting? Let’s talk. 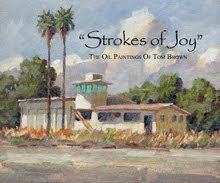 tombrownstudio@cox.net. I also host a TV art show. (Videos of my shows are available on DVD.) And I teach frequent workshops for other artists, both outdoors (en plein air) and in the studio. I even teach a special workshop on how to create extra large paintings for homes, offices and public buildings. My work has sold through prominent galleries for more than 20 years. My first major show in a Chicago gallery was sold out on the first day. And I have countless satisfied buyers across the country and abroad. I would be happy to work with you to create something special for you. There is no obligation to discuss your wishes. You can reach me at tombrownstudio@cox.net. Thanks for looking. Have a wonderful day. I was recently commissioned by the City of Irvine to create three large landscapes for permanent display in the lobby of the Civic Center building. Each canvas measures 5 feet wide. The paintings have been delivered and will be installed later this month. I accept commissions for paintings of all sizes but I usually show small appetizers on my daily blog. This enables new collectors to become familiar with my work before committing to larger purchases. Much of my work is done on a commission basis, so if you are interested in something special I would be happy to discuss details. You can contact me at tombrownstudio@cox.net. There is no obligation. 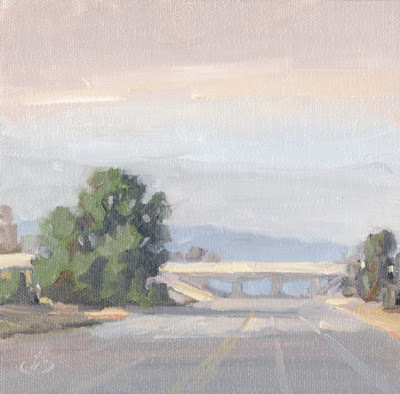 Just a quick reminder to other artists that my new 5-week Plein Air Workshop begins July 12 and there is still time to enroll. If you can’t attend my workshops you may be interested in my CDs or DVDs on plein air painting. It’s the next best thing to painting on location with me. The DVDs are episodes from my TV show that were filmed live on location. Email for details: tombrownstudio@cox.net. 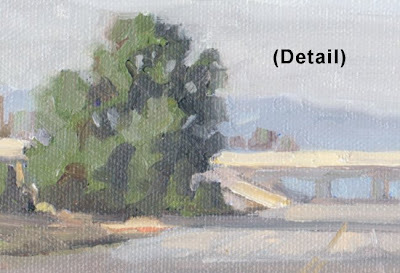 Just a quick reminder that my new 5-week Plein Air Workshop begins July 12 and there is still time to enroll. If you can’t attend my workshops you may be interested in my CDs or DVDs on plein air painting. It’s the next best thing to painting on location with me. Email for details: tombrownstudio@cox.net. 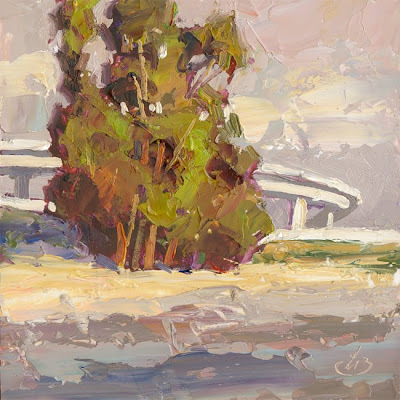 I teach a plein air class for other artists on Saturday mornings, and constantly scout for new locations to keep it interesting. This beautiful spot at the ocean is a place I plan to teach a class soon and couldn’t resist painting it while I was there to check it out. 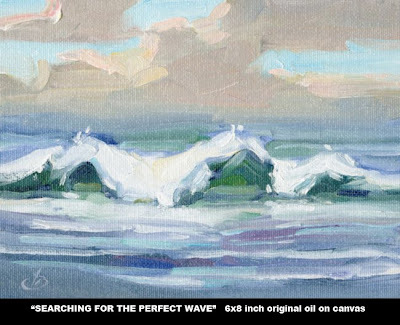 I wanted to capture the shimmering reflections of the white foam beneath the waves in this painting. I even shot reference photos for the benefit of my students so I could point out some of the things to watch for when painting waves. I wasn’t sure if the camera would capture it, but if you look closely you can see these reflections in the photos as well. 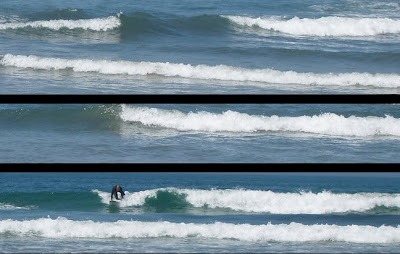 By the way, check out the surfer catching the wave in the bottom photo. If you can’t attend my workshops you may be interested in my CDs or DVDs on plein air painting. It’s the next best thing to painting on location with me. Email for details: tombrownstudio@cox.net. Find the wonder in the world around you today, and help others see it with you. Yes, I actually go out painting on location at night! Students who have joined me are surprised at how easily your eyes adjust. To help illuminate my work I use the small headlamp shown here that attaches to my cap. It focuses just enough light on my palette and painting, without ruining my night vision. The visor of my cap prevents the light from glaring into my eyes as I work. I did a quick pencil sketch of this gentleman before beginning the painting because I expected him to move before I could complete the painting. He didn’t. He remained in essentially the same position the entire time I worked. He endlessly rummaged through his bag of worldly goods as I sat in the comfort of my car with my small paintbox. Aaron is his name, which I learned while talking with him after completing the painting. He had marvelous and interesting stories to tell as we had lunch together at a local restaurant, my treat. Afterwards we both went our separate ways, a little richer for the experience. Find the wonder in the world around you today, and pass the feeling along. Yesterday I promised to show a painting today that demonstrates the relationship between painting with brushes or with a palette knife. This is a still life that was set up outdoors in my back yard and painted from life. In the early stages of this painting I used abstract spots of color to locate the key shapes of the flowers, fruit, etc. These “color spots” are similar to how I approach a palette knife painting. I look for the big shapes and simplify them before adding any detail. In this case the initial color spots merely reserved spaces on the canvas for these elements, and were not intended as the final colors. 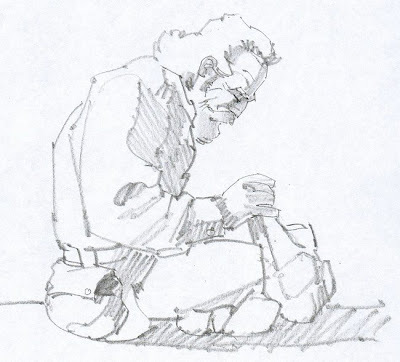 Each shape was then developed more fully until enough information was included to communicate the subject. 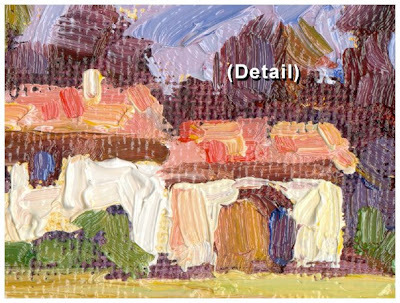 It is the color, value and shapes of the key elements that actually carries a painting; detail is far less important. 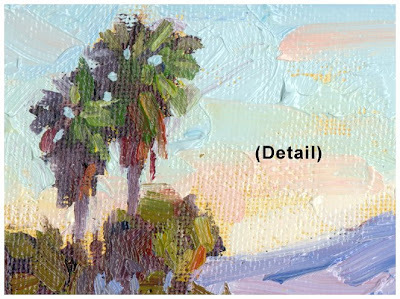 In fact this is the subject of a special Plein Air workshop I will be teaching this Saturday in Orange County for other landscape painters. If you’re an artist living in the area you may want to join us. Email me for details: tombrownstudio@cox.net. Hope you found this interesting. Have a colorful day! Never put off a once-in-a-lifetime opportunity until next time. Huntington Beach is officially known as “Surf City” but it wasn’t surfer-friendly this day. The ocean was roiling and storm clouds were moving too fast for comfort. But the mood was priceless and I wanted to capture it while I could. Bad news! When I reached for my paints I discovered I was out of art panels! I ripped the cardboard off the back of a pad of paper and clamped it into my paintbox. In moments my palette knife was swirling faster than the ocean and my heart was pounding louder than the surf. “Bam!,” as Emeril would say. Got it; just in time. 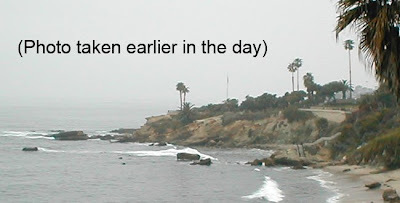 The oil rig off the coast is barely recognizable here but I was comfortable with that because the weather was so heavy it was barely visible to the naked eye. This study borders on abstract but it captures the mood of the moment. The painted area measures just a bit over 3 inches wide but click the image for a larger view and have a closer look. All the colors of the ocean are preserved in this little gem. 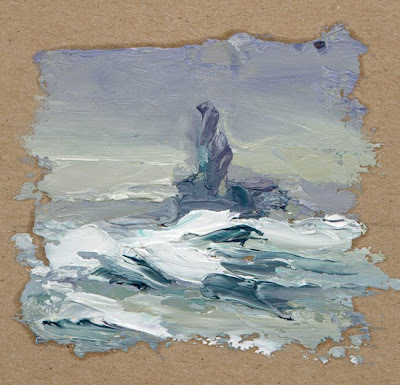 I don’t know quite how to price this little study, but if you’re interested in owning it email me at tombrownstudio@cox.net and we’ll work it out. 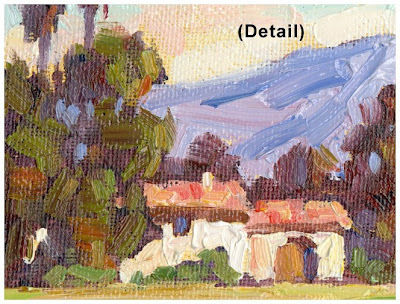 Artists: This Saturday I will teach a special Plein Air class in Orange County focusing on the relationship between palette knife paintings and typical gallery paintings done with brushes. 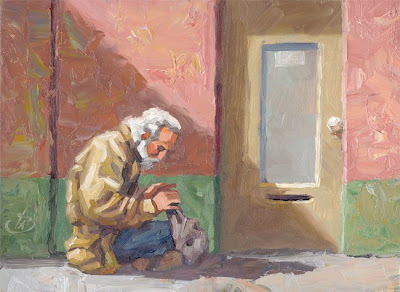 The two methods of painting are interconnected on many levels and this promises to be an interesting workshop. Artists living in the area are welcome to join me. Email for details: tombrownstudio@cox.net. Birds nesting in the top of this towering tree made me think of it as Nature’s hi-rise, hence the title. 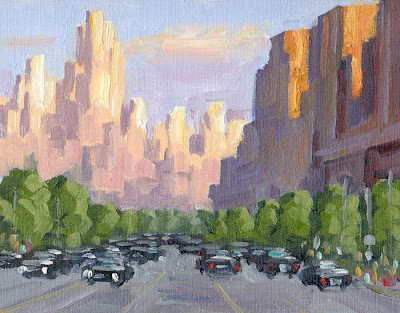 This painting was done entirely on location in the fading light of dusk. The colors in this piece are very soft and subtle, and really need to be seen in person to be appreciated. If you wish to purchase this painting, email me at tombrownstudio@cox.net. Recently I’ve been showing paintings done with a palette knife; today’s painting was done with brushes. 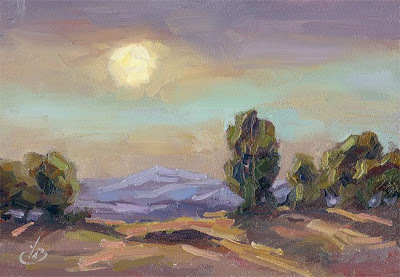 The two methods of painting are interconnected on many levels, and this Saturday I will teach all about this in a special Plein Air class. Artists living in the Orange County area are welcome to join me. Email for details: tombrownstudio@cox.net. This is another magic moment captured with a palette knife and the handy little paintbox that I’ve described in past blog posts. By keeping it ready in the car at all times I am able to take advantage of opportunities like this on the spur of the moment. Unfortunately I didn’t have my camera handy to show a photo for comparison. I feel lucky to have been able to get this while the moment lasted. By seeing with his soul an artist should breathe life into a subject and create magic, where a camera can merely record facts. A good example is this scene of a city street and freeway overpass. Something probably overlooked by many, but rich with beauty when you stop to study it. I thought it might be interesting to include a photo of the actual scene for you to compare with my interpretation of it. I don’t wish to copy things the way a camera sees them, I prefer to paint my emotional reaction to the world. By viewing things this way, even the most mundane subject can be transformed into a work of art. Have a day filled with feeling, and share that with others. The gull landed and added a nice touch as I was painting at the edge of Balboa Island. I decided to include him in the painting. I was attracted to this scene by the way the boat contrasted with reflected colors in the water from trees and homes on the opposite bank. The gull was also nicely framed by the dark tones in the water, and his reflection was silhouetted against lighter tones of the sky in the water. As with my other recent palette knife paintings, I used loads of rich, juicy oil paint in creating this piece. The knife adds a painterly looseness that I enjoy. Click the detail images for a better view. This one is a true delight to study at close range. 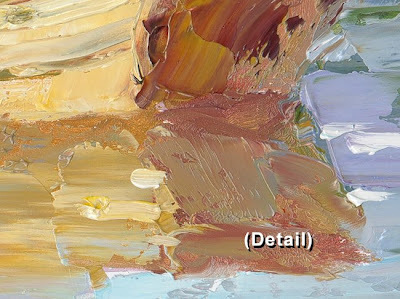 You can really "get lost" in the color, textures and brushwork. Enjoy it. Have a wonderful day, and thanks for looking. The true soul of this painting lies in the richly textured strokes of thick, juicy oil paint. Click the images to see the sculptural surface effect this creates on the canvas. 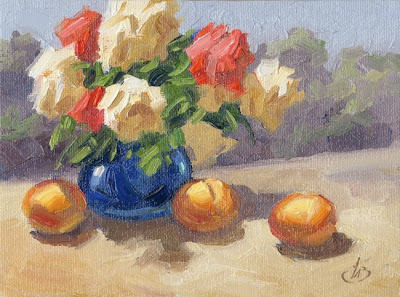 This idyllic scene has great presence and will bring a note of color and life to any room. But the subject is only part of the message. From across the room a painting should speak to the viewer; I call this wall power. 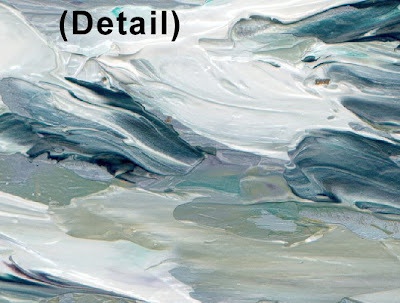 And when the painting beckons to be scrutinized more intimately, the viewer should discover unexpected layers of additional appeal like brushwork, surface texture and other factors that enhance the visual experience. This combination of elements keeps a viewer in love with a painting over time. They create magic that lasts. 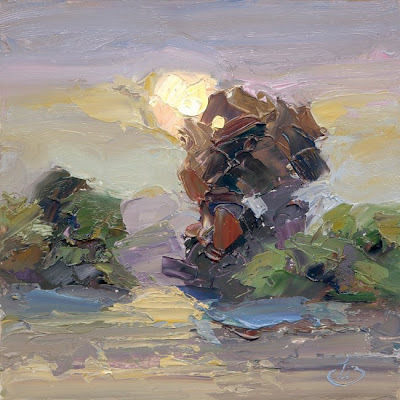 The sculptural brushwork in this painting is a variation of the same effect demonstrated in the palette knife paintings recently posted on my blog. This time it was created with a brush, but the concept is the same. These are some of the lessons I will be teaching in upcoming classes and workshops for other artists. If you’re an artist who lives near Orange County you may want to consider joining us for a few of these sessions. They’re always great fun and you’re sure to enjoy yourself. If you would like to purchase this painting, email me at tombrownstudio@cox.net. Thanks for looking. Have an idyllic day. Life is good. This is another of my finger paintings, and it was great fun! The bare field, freeway bridge and huge stand of trees caught my eye. I suppose that subject may not appeal to some, but I found it beautiful and I couldn’t resist. I painted the majority of this picture with my fingers and a palette knife, then added a few details with one small brush. I shot a reference photo as I set up to paint, although you’ll notice that the colors of the sky changed quite a bit as I worked. But I thought you would be interested in seeing how the actual scene looked when I arrived. 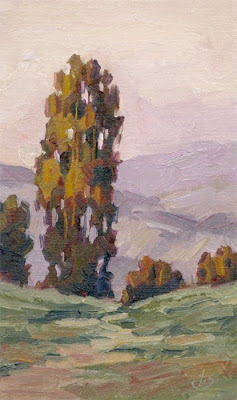 Paintings created outdoors directly from nature enable an artist to capture unique characteristics of the scene, which accounts for the great popularity of plein air paintings by collectors, galleries and museums. I think that quality can be seen here (click the image for a larger view). 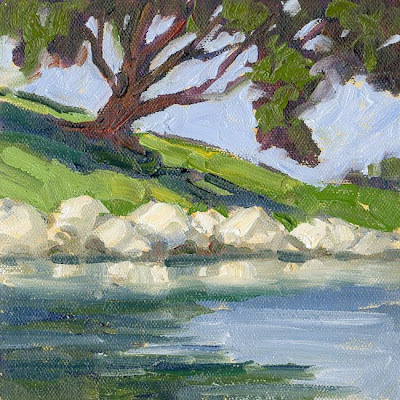 These plein air pieces are like little jewels that just seem to sparkle with color and light. I arrived at this location on my mountain bike with my compact metal paintbox attached to the back of the bike. 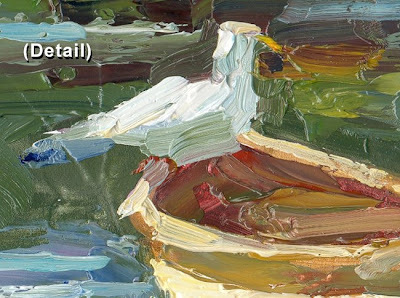 This is the same paintbox described in my “PLEIN AIR” CD. It’s very sturdy and portable. And it sets up instantly. When I finished painting I merely closed the lid and I was packed and on my way! 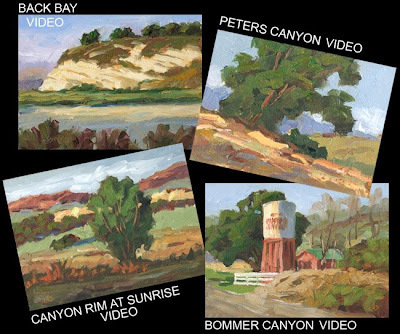 If you’re an artist interested in trying your hand at plein air painting, email me and I’ll share some free tips on getting started like I teach on my TV show. If you would like to purchase this painting, email me at tombrownstudio@cox.net. Thanks for looking. Have a great day, and take time to notice the beauty around you. Here’s a glimpse behind the scenes to show how I sometimes work. This young girl posed during a brief demonstration I did in a recent portrait workshop. 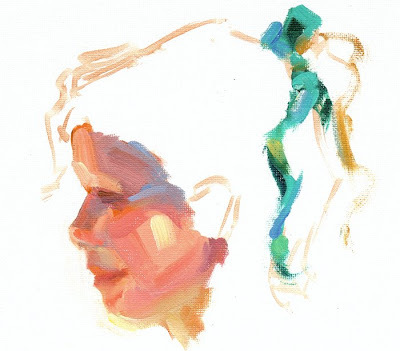 The goal was to create form and features in her face with a minimum of fuss, using well placed strokes of color and value. For this exercise we were outdoors in direct sunshine and light was reflected into the shadows of her face. I wanted to capture that effect and also demonstrate how creative use of color can add artistic flair. 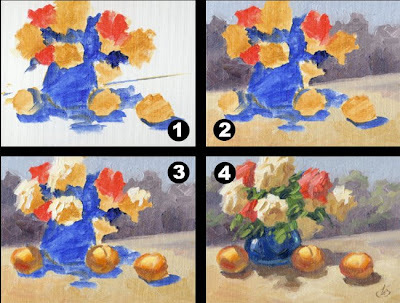 This is just one of many approaches an artist can use, as shown in my instructional CD on portrait painting. This piece was not originally intended for sale, but if you would like to own it email me at tombrownstudio@cox.net. 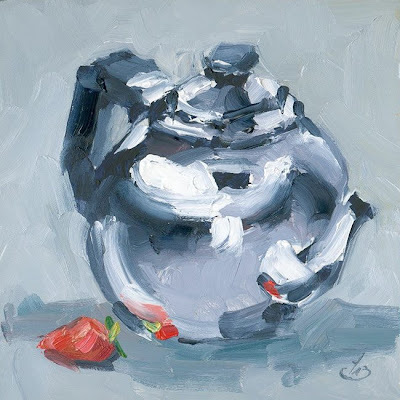 I hope you enjoyed this change of pace from my usual plein air landscapes and still life compositions. Have a wonderful day; it’s a beautiful world! 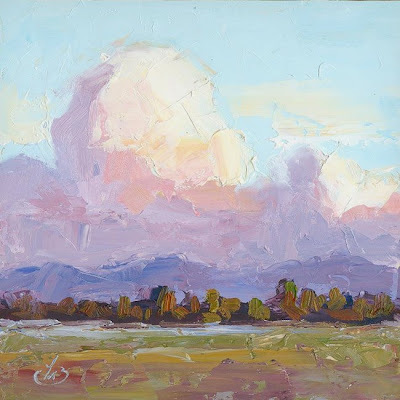 Paintings created outdoors directly from nature provide a direct connection between artist and the landscape. 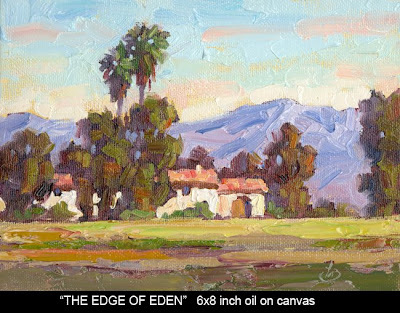 This enables the artist to capture unique subtleties that account for the great popularity of plein air paintings by collectors, galleries and museums. Painting outdoors at night presents unique challenges, however. Moonlight tests the artist’s skills at color mixing and blending. But nothing beats the feeling of having a look at the results next morning and realizing you created a winner. When painting under challenging conditions I prefer to simplify the variables. 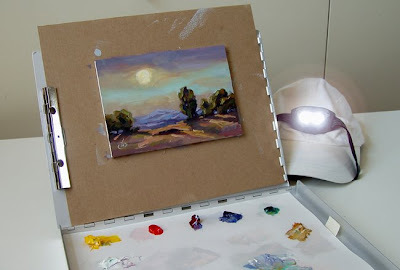 With only a palette knife and my fingers I created this moonlit scene outdoors at night using the small metal paintbox shown in my “PLEIN AIR” CD. 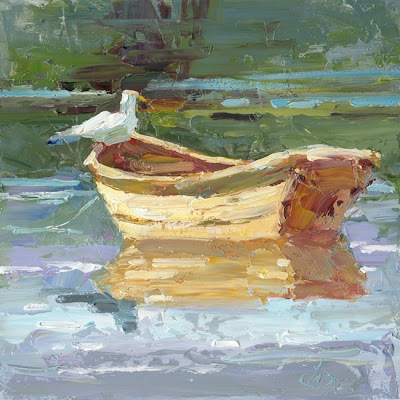 The palette knife provided rich texture and eliminated the need for brushes, solvents or mediums. Pigments were used straight from the palette. And there were no brushes to clean afterwards. Using my fingers I softly blended the sky, which provided a wonderful contrast to the bold texture of the palette knife strokes in the trees and land. My compact paintbox was worth its weight in gold. It securely held the painting in place as I worked. When I finished I simply closed the lid, with palette and painting safely held in place to carry home.